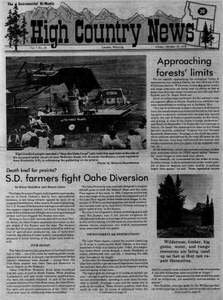 The Bureau of Reclamation's Oahe Diversion Project, ballyhooed for nearly 30 years as the savior of South Dakota's family farm agricultural economy, is now being bitterly opposed by many of its supposed beneficiaries as construction begins. We are rapidly approaching the ecological limits of resources on out national forests, say two officials of The Wilderness Society. Alaska's oil boom brings big paychecks, but also inflated prices. Nearly everything about Alaska's boom is bigger -- the distances, the physical discomfort, and the appetite for money.